Student protesting on February 12th, 2014. Photo by Carlos Becerra, copyright Demotix. 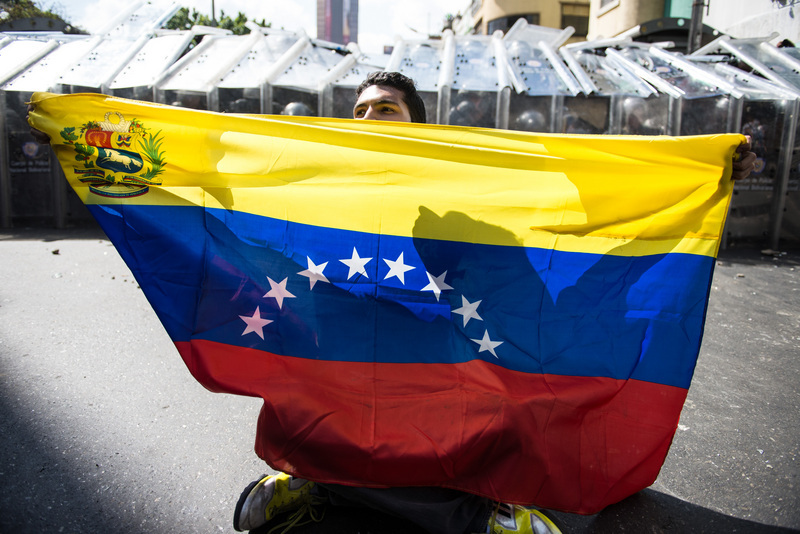 Yesterday Venezuela saw a wave of protests [en] in the streets of its major cities. The citizens, mainly university students, took to the streets to demand that the authorities release a group of young people who had been arrested in previous demonstrations. They also demanded improvements in food supply (food shortages [en] are around 27%) and public safety. The march, which aimed to reach the federal prosecutor's office, was organized mainly by opposition leader Leopoldo Lopez. The protest unfolded peacefully until the demonstrators neared the center of Caracas, where a group of riot police and members of armed security forces, hooded and on motorcycles, had taken control of the zone. The majority of the protesters left the area, but a small group remained and clashed with the security forces. The confrontations in the center of Caracas resulted in two fatalities: a student and a member of a collective. Users uploaded videos of the moment when Bassil Alejandro Da Costa Frías was hit by a bullet and killed. The protests spread to the east of the city, and during the night, another student was killed. The day ended with a toll of three deaths and dozens of people injured and arrested. 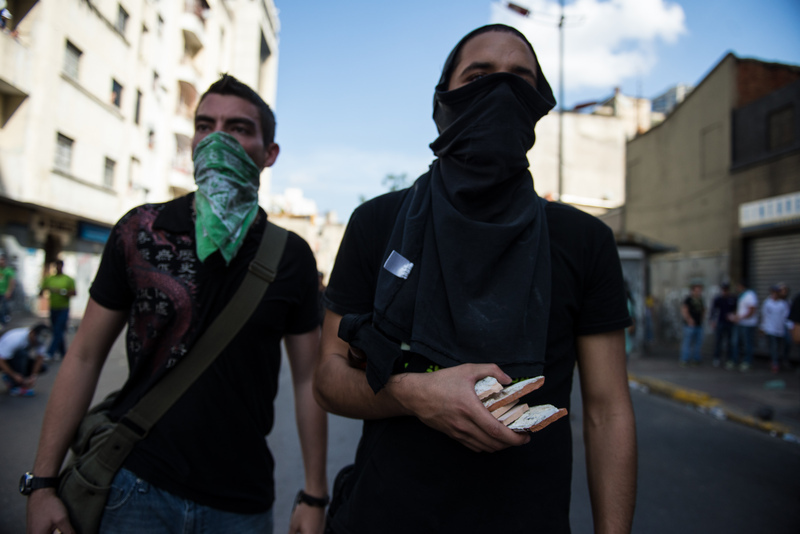 Young people protesting in Caracas on February 12th, 2014. Photo by Carlos Becerra, copyright Demotix. During the events, including the march and the ensuing violence, Venezuelan media continued to air their regular programming, after authorities threatened [en] to sanction any media that covered the protests. Those who sought information about what was happening had to tune in to the cable news channel NTN24. In the afternoon, journalists of the news channel NTN24 condemned the fact that the government had pressured subscription television companies to remove NTN24 from their selection of channels. Minutes later, the complaint had become reality, and Venezuelans could see the channel only via internet. At 6:17 PM Caracas time, the signal for NTN24 went dead on MovistarVe. A los panas fuera de Venezuela: 2 estudiantes asesinados y blackout informativo del gobierno. Los milicos reprimiendo. To our friends outside of Venezuela: two students killed and information blackout by the government. Police are repressing. 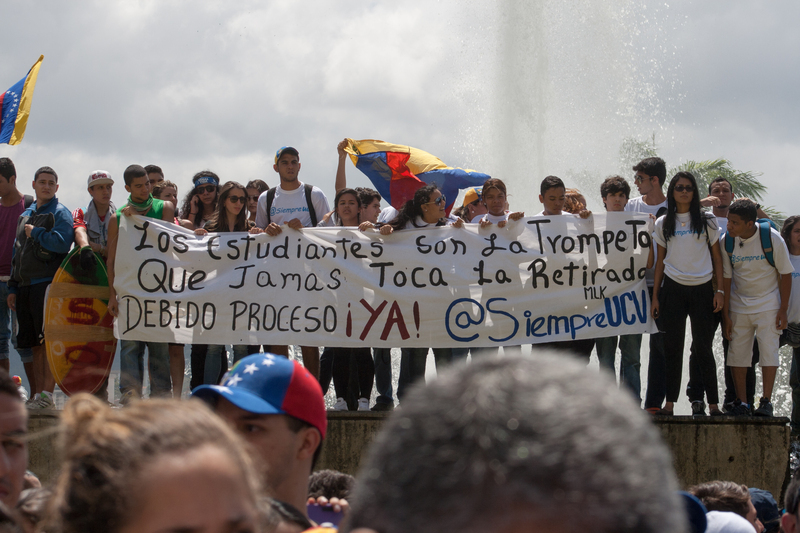 Students protesting in Caracas. Photo by Juan Hernandez, copyright Demotix. No protestes porque te disparo. No reclames porque te meto preso. No informes porque te saco del aire. Linda democracia no? Don't protest, because I'll shoot you. Don't make demands, because I'll take you prisoner. Don't inform, because I'll take you off the air. Nice democracy, right? “La salida” [The Exit] that some people are proposing is undemocratic. There are loopholes and ways to “exit” the government, including a recall referendum. Not by force. The night ended with a national parade where President Nicolas Maduro celebrated Youth Day and the bicentennial of La Batalla de la Victoria. Furthermore, a judge issued an arrest warrant for Leopoldo Lopez. This morning, the office of his party, Voluntad Popular, was searched. The protests have not stopped. The Facebook page Rebelión 2014 is collecting reports and photos (unverified) of the current protests.